I’m from Detroit’s Southwest side and currently live in Detroit, Michigan. At Eastern Michigan University, I studied Cinema and Philosophy. After graduating in 2009, I started working in the entertainment industry. I also run some festivals and events, do some book research and a variety of consulting. My current big focus is the Detroit Festival of Books, which I created and am the event chairman for. I also write every single day. The Place Collection is wide-ranging, however, the core is comprised of Counterculture/Sixties, Incunabula, Occult, Classics, Exotic/Unusual, Obscure Dictionaries and Illuminated Manuscripts. There are approximately 2,000 volumes in my collection. Over half of them are in boxes because I don’t have the requisite display space. My goal is to one day build a home library with in-built bookcases, sliding ladders, big globes, expensive scotch, the whole meshuggeneh. Been collecting since I was five. Not sure what my first book was but I really enjoy the ‘Tao Te Ching’, the 1989 Gia-Fu Feng version. The Tao that can be told is not the eternal Tao. One of the more recent acquisitions was ‘Opus Sadicum’ (1889). It’s the first English edition of Justine and has a beautifully engraved frontispiece. It was published by Isidore Liseux in Paris. I won it via online auction, it came from the Netherlands. God bless the Dutch! Selecting favorites is always tough. One of the rarest and personal favorite books in my collection is the advance readers copy of ‘The Rose of Paracelsus: On Secrets & Sacraments’ by William Leonard Pickard. Leonard is a brilliant human and wrote this fantastic otherworldly book in prison. I helped do some research for the book. The ARC is only one of 7 in existence. Bargains abound! Book sales are your oysters, you just have to pry them open, do some digging. I was driving down a barren stretch of road once in semi-fog near the city of Romulus, Michigan when I saw a crudely hand-drawn sign on somebody’s lawn saying booksale inside. The lady inside says “They’re in the basement. Be careful down there. You’ll need this,” she hands me a big Maglite flashlight. The basement had no lights but was full of hundreds of boxes books. Hundreds. Untouched for decades. Treasure awaiting a plucky unearther. Not a single other person was around, which was eerie. I ended up finding an early 18th century French Astronomers manual. She only charged me $5.00 for it but it turned out to be worth hundreds. Holy Grail for my collection right now would be ‘Motor City Madam’ (1964) hardcover with the dust jacket. It’s the memoir of Detroit prostitute Rocking Chair Helen McGowan. You can find hardcovers here and there but rarely with an intact and near mint condition DJ. I’m also looking for a rare board game, ‘The Phantom of the Opera Mystery Game’ (1963) it’s muy difficult to find in good condition. If you know where I can get one, hook a brotha up! 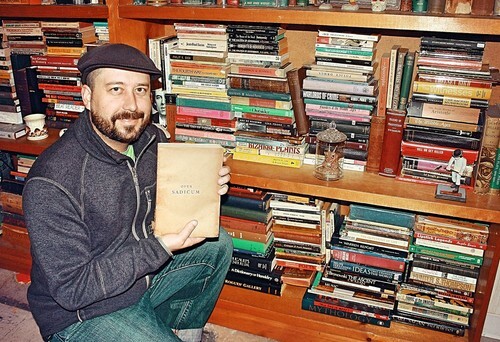 Favorite bookseller is Mr. John King who runs John K. King Used & Rare Books in Detroit. His store is on all the lists of the world’s best bookstores and when you visit his main 3-level store and Rare Book Building behind the main store, you’ll know why. Every bookworm must make a pilgrimage to John King Books at least once or twice or thrice. I also collect vinyl records, vintage board games, movies, personal ephemera. And from my bank, I’m forced to collect overdraft receipts and stern lectures on the manifold virtues of prudent spending. To them I always say, I collect books baby, not cash. One day I’ll collect both. I'm from Detroit's Southwest side and currently live in Detroit, Michigan. There are approximately 2,000 volumes in my collection. Over half of them are in boxes because I don't have the requisite display space. My goal is to one day build a home library with in-built bookcases, sliding ladders, big globes, expensive scotch, the whole meshuggeneh. Been collecting since I was five. Not sure what my first book was but I really enjoy the 'Tao Te Ching', the 1989 Gia-Fu Feng version. The Tao that can be told is not the eternal Tao. One of the more recent acquisitions was 'Opus Sadicum' (1889). It's the first English edition of Justine and has a beautifully engraved frontispiece. It was published by Isidore Liseux in Paris. I won it via online auction, it came from the Netherlands. God bless the Dutch! Selecting favorites is always tough. One of the rarest and personal favorite books in my collection is the advance readers copy of 'The Rose of Paracelsus: On Secrets & Sacraments' by William Leonard Pickard. Leonard is a brilliant human and wrote this fantastic otherworldly book in prison. I helped do some research for the book. The ARC is only one of 7 in existence. Bargains abound! Book sales are your oysters, you just have to pry them open, do some digging. I was driving down a barren stretch of road once in semi-fog near the city of Romulus, Michigan when I saw a crudely hand-drawn sign on somebody's lawn saying booksale inside. The lady inside says "They're in the basement. Be careful down there. You'll need this," she hands me a big Maglite flashlight. The basement had no lights but was full of hundreds of boxes books. Hundreds. Untouched for decades. Treasure awaiting a plucky unearther. Not a single other person was around, which was eerie. I ended up finding an early 18th century French Astronomers manual. She only charged me $5.00 for it but it turned out to be worth hundreds. Holy Grail for my collection right now would be 'Motor City Madam' (1964) hardcover with the dust jacket. It's the memoir of Detroit prostitute Rocking Chair Helen McGowan. You can find hardcovers here and there but rarely with an intact and near mint condition DJ. I'm also looking for a rare board game, 'The Phantom of the Opera Mystery Game' (1963) it's muy difficult to find in good condition. If you know where I can get one, hook a brotha up! Favorite bookseller is Mr. John King who runs John K. King Used & Rare Books in Detroit. His store is on all the lists of the world's best bookstores and when you visit his main 3-level store and Rare Book Building behind the main store, you'll know why. Every bookworm must make a pilgrimage to John King Books at least once or twice or thrice. I also collect vinyl records, vintage board games, movies, personal ephemera. And from my bank, I'm forced to collect overdraft receipts and stern lectures on the manifold virtues of prudent spending. To them I always say, I collect books baby, not cash. One day I'll collect both.